Our Audiologists are here to provide comprehensive hearing evaluations and recommend if you have hearing loss that is not medically treatable. Please contact us today for your Hearing Evaluation (815) 531-3802. Our goal is to deliver compassionate and caring ENT services to our patients. We are conveniently located in three different offices Joilet, New Lenox, and Morris, Illinois. We're Trusted, Experienced, Compassionate and Caring! ENT Surgical Consultants is Chicagoland’s premier provider of adult and pediatric ear, nose and throat medical care. Our exceptionally trained, board-certified physicians are unmatched in quality and commitment to patient care. Our comprehensive services include cutting edge ENT surgery and state-of-the-art diagnostic testing. Our patients are referred to us because we are trusted and experienced. Our goal is to deliver compassionate and caring ENT services to our patients. We are conveniently located in three different offices Joilet, New Lenox, and Morris, Illinois. 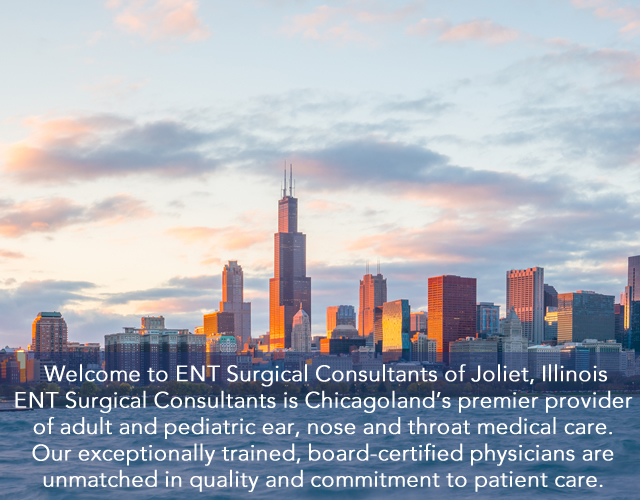 ENT Surgical Consultants is Chicagoland’s premier provider of adult and pediatric ear, nose and throat medical care for the past 20 years. Our six exceptionally trained, board-certified physicians are unmatched in quality and commitment to patient care. Our patients are referred to us because we are trusted and experienced. Our goal is to deliver compassionate and caring ENT services to our patients. Our highly trained staff is experienced in handling the most complex ENT conditions with the attention to detail that you deserve. We are conveniently located in three different offices in the Southwest Chicago Metro area near Joliet, Illinois. We thrive in a community with three major hospitals. We also utilize Allscripts-Misys electronic medical records. This latest accreditation awarded to ENT Surgical Consultants demonstrates the facility’s ongoing commitment to providing quality patient care in CT.. Welcome Dr. Walter Rooney to the Practice! Dr. Walter Rooney enjoys treating the full spectrum of ear, nose, and throat problems. He is board certified in Otolaryngology – Head and Neck Surgery and Facial Plastic Surgery by the American Board of Otolaryngology and the American Board of Facial Plastic and Reconstructive Surgery, respectively. Advanced and Fellowship Trained Pediatric ENT care including tonsillectomy and adenoidectomy, tympanostomy, nasal and sinus surgery, allergy treatment, laryngomalcia, subglottic and tracheal stenosis, hearing loss and speech delay. When placed in the sinus following surgery, PROPEL decreases scarring and inflammation, reducing the need for additional surgical procedures and oral steroids that can have serious side effects. The spring-like PROPEL implant props open the ethmoid sinus to maintain the surgical opening, delivers an anti-inflammatory medication directly to the sinus lining, and then dissolves, avoiding the need for removal.